Paul Zorn and I have just published a special issue of PRIMUS on Improving the Teaching and Learning of Calculus (Bressoud & Zorn, 2018). It contains eight articles that should be of interest to anyone who is discontented with the current state of calculus instruction at their institution. Four of these articles present case studies of universities that have made significant changes within the past few years: San Diego State University (SDSU), the University of Illinois-Chicago, Colorado State University, and the University of Hartford. 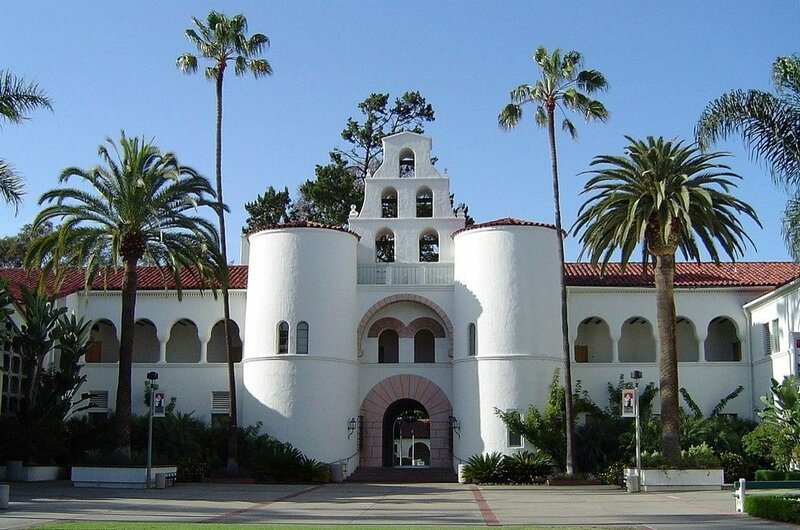 The most extensive revamping occurred at San Diego State University, which is where I am focusing below. Figure 1. The landmark Hepner Hall at San Diego State University. With roughly 30,000 undergraduates, San Diego State University is a large public university, part of the California State University System, and chronically underfunded. It is a Hispanic-Serving Institution where 84% of students are on some form of financial aid. Science, technology, engineering, and mathematics (STEM) majors account for 10% of bachelor’s degrees. The mainstream precalculus and single variable calculus courses enroll about 1,500 students each fall. The Department of Mathematics and Statistics consists of 17 faculty in pure and applied mathematics, seven in statistics, and six in mathematics education. Michael O’Sullivan was appointed chair of the department in 2014. He made it his mission to revamp lower-division mathematics instruction. The effort began that fall with the creation of a Calculus Task Force charged with proposing a system for coordinating the courses in the Precalculus to Calculus II sequence (P2C2). As Rasmussen and Ellis (2015) have documented, one of the most important characteristics of successful P2C2 programs is coordination of the essential elements of each course including policies, learning objectives, and exams and their scoring rubrics. Coordination also involves regular communication among those teaching different sections. At San Diego State University, total autonomy—to the point where different instructors were using different textbooks, homework systems, and even course content—had been the rule. As the department expanded its data collection beyond simple pass rates, they discovered that only 17% of those who began with Precalculus successfully completed Calculus II, only 10% within the standard three semesters. This made mathematics faculty aware that something was seriously wrong and needed to change. Because the discontinuation of large lectures was not financially feasible, the implementation of active learning to address this completion rate was concentrated in breakout sections led by Graduate Teaching Assistants (GTAs). The chair successfully lobbied to increase breakout sections from one to two hours per week and managed to reduce the size of most of these sections. The chair also tied into a university initiative, Building on Excellence, to fund a new Mathematics Learning Center within the library building, directed by the office of the Dean of Science—ensuring its continued funding—but led by the department. The static 40-question placement exam was replaced by ALEKS Placement, Preparation, and Learning, with the license paid by the California State University System and student payments of $20 per proctored exam. While these contributions were serendipitous, I have found that—particularly in situations of tightly constrained budgets—deans and provosts are keen to direct resources toward strategic initiatives with the potential for high impact. I have frequently encountered deans who asserted that if only the department would come forward with a well-thought-out and cost-effective plan for improving student outcomes, the money could be found to fund it. As the authors reported, the effort at revision was successful because of the attention paid to opening and maintaining communication channels with stakeholders in this process (see Figure 2). Figure 2. Significant communication channels between the mathematics department and various administrative programs as they relate to the seven targeted program features. Source: Apkarian et al. 2018, p. 540. The result is a calculus program of which the department is justly proud, as reflected in this video. Students find the new Math Learning Center particularly helpful because its work is tightly connected to what is happening in all sections of each course. 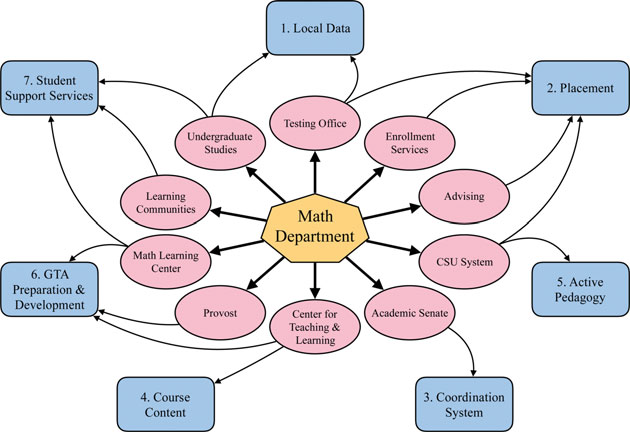 The Department of Mathematics and Statistics at San Diego State University is a good example of how a program can be transformed. Its story illustrates the role of leadership from the department chair, buy-in and effort from a core of committed faculty, and strong two-way communication with all of the stakeholders. Bressoud, D., and Rasmussen, C. (2015). Seven characteristics of successful calculus programs. AMS Notices. 62:2, 144–146. Bressoud, D. and Zorn, P. (2018). Improving the Teaching and Learning of Calculus. PRIMUS vol. 28. Rasmussen, C., and Ellis, J. (2015). Calculus coordination at PhD-granting universities: more than just using the same syllabus, textbook, and final exam. In Bressoud, Mesa, and Rasmussen (Eds. ), Insight and Recommendations from the MAA National Study of College Calculus. MAA Notes #84. Washington, DC: MAA Press. Local Data. Regular collection and use of local data to guide program modifications as part of continual improvement efforts. Placement. Effective procedures for placing students appropriately into their first Precalculus to Calculus II (P2C2) course (both initial placement and re-placing students after the term begins). Coordination System. A coordination system for instruction that (i) makes use of a uniform textbook and assessments and (ii) goes beyond uniform curricular elements to include regular P2C2 instructor meetings in development of de facto communities of practice. Course Content. Course content that challenges and engages students with mathematics. Active Pedagogy. The use and support of student-centered pedagogies, including active learning strategies. GTA Preparation & Development. Robust teaching development programs for teaching assistants.